ABOUT: Flawless prewar Chelsea loft with abundant natural southern light, two generous bedrooms and two elegant bathrooms. High ceilings, hardwood floors, central air conditioning, surround sound, tilt & turn windows, tasteful custom built-ins and outfitted closets are throughout this exclusive home. Great Room and Dining Room are perfect for entertaining. MPD Design Build custom kitchen has Corian countertop and integral sink, marble backsplash, SubZero refrigerator and freezer, U-Line wine refrigerator, Miele dishwasher, Wolf stove with six burner gas cooktop, vented hood and custom cabinetry with substantial storage. Corian shelved pantry closet includes vented LG Tromm washer and dryer. Luxurious master bedroom suite has an exquisite en-suite bathroom and a lavish dressing room. 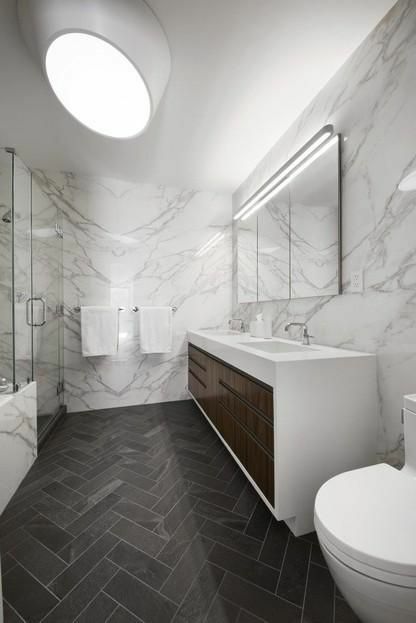 Master bathroom has Italian porcelain floor tiles, radiant heat, Neolith wall panels, soaking tub, separate shower, Robern medicine cabinets, master bath counter top, integral sinks and vanity apron are Caesarstone. Additionally there is a spacious second bedroom, beautiful second bathroom and a home office. ABOUT: From the moment you step off the elevator, this home will literally take your breath away. Saturated with southern & western light and graced with views of the Hudson River, this stunning 3-bedroom, 4-bathroom duplex features 2,410 sq. ft., soaring 19-ft double height ceilings, floor-to-ceiling Schuco windows and a pair of private, north-facing balconies. The grand living space is designed with an open concept allowing for effortless living and entertaining. The high-end kitchen opens to the dining area and is a show stopper in its own right with the sleek custom cabinetry by Eggersman, Honed Montclair Danby marble countertops and top-of-the-line appliances including a Sub Zero refrigerator and Miele ovens. Follow the 7-inch wide plank European oak flooring down the hall to the two generous sized bedrooms, two full bathrooms and a private balcony. The upper level of the apartment contains a stylized mezzanine bedroom and bathroom and the home’s palatial master suite featuring a huge walk-in closet, a private balcony, an extravagant master bathroom complete with dual-vanity sinks, a walk-in shower with a Raindance showerhead and a Duravit soaking tub. 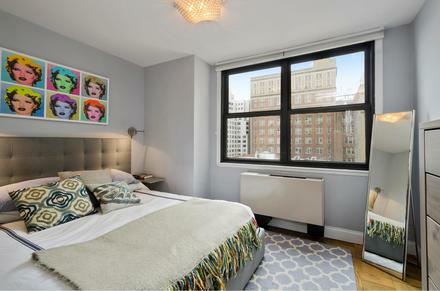 ABOUT: This Gramercy Park stunner is a total gut renovated one bedroom . Situated on idyllic Irving Place in one of the best buildings in Gramercy. This light filled one bedroom enjoys both open eastern and southern views for constant sun throughout the day. The open kitchen features new slate flooring, granite countertops and top of the line stainless steel appliances. The windows are outfitted with Hunter Douglas shades. Bathroom has been immaculately renovated as well. 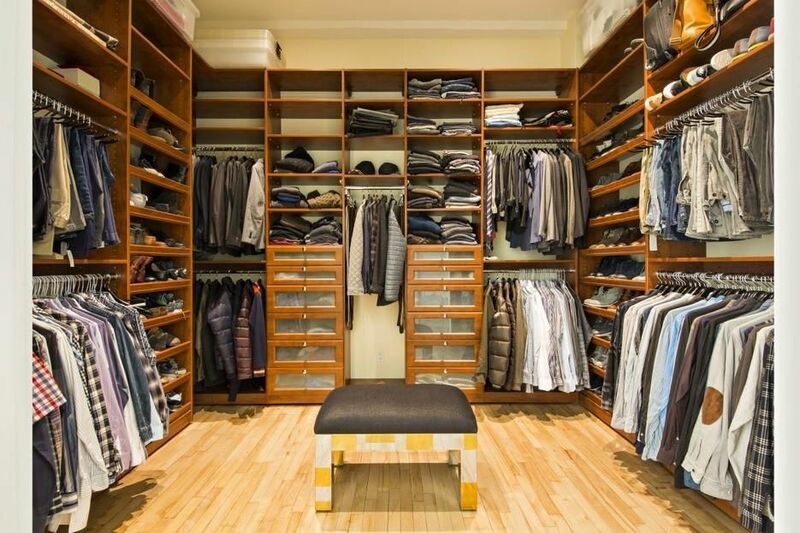 The apartment has four extremely large closets making this a rare one bedroom with plenty of storage space! Gramercy Plaza has a sweeping 360 roof deck, beautiful common garden and laundry room. 24 hour doorman and on site superintendent. Steps to all subway transportation, Gramercy Park and the Union Square farmer's market.Please note broker is owner.